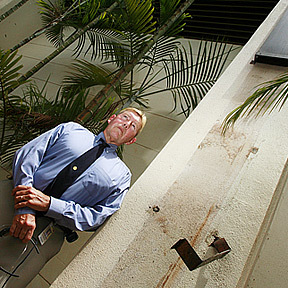 COPPER THEFTS: Mililani High School Vice Principal Jim Petersen stands by what remains of one of nine copper downpour spouts stolen from the gym over the past week. A fourth member of the family is critically hurt after their car is hit by a truck. Nine people fall ill after buying from Maui stores. The possible trip would mark the Filipino centennial. Romi Beppu is anticipating a warm welcome home when she dances the role of the Lilac Fairy in Ballet Hawaii's "Sleeping Beauty" this weekend. The Wahine coaching staff is uniquely qualified to work with All-American Kamana'o. 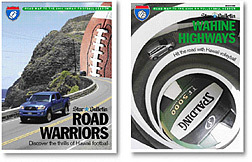 Our 80-page guide maps out the season for the Warriors and Wahine. » Honolulu Council Chairman Donovan Dela Cruz says superstores impact local communities. » Councilman Charles Djou says he opposes the bill because it unfairly singles out Wal-Mart Stores. State official have broken ground on a project for construction of homes for Hawaiians in Kapolei.